Frenched lamb racks don’t have to be roasted whole or sliced into individual lamb rib chops. Here are some ideas for varying their look. While you can use a chef’s knife for these techniques, we recommend using a very sharp rigid boning knife or paring knife for the best results. What is a Lamb Spider Rack? While frenched lamb racks are ready to cook and look very nice, some chefs prefer to trim theirs further into what butchers call a “Spider Rack”. 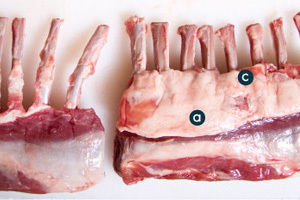 Lamb spider racks have a cleaner look for better presentation, and can be easier for people to eat too. 1. Trim off the surface fat and silver skin: Drawing the point of a knife (preferable a rigid boning knife)across the surface of the fat/silverskin and peeling it back as you continue to make shallow passes up the rack towards the bones. 2. Cut between the frenched bones into the meat by another inch to expose even more bone. Remove the small resulting chunks (called “finger meat,” these can be sautéed up for a snack). 3. 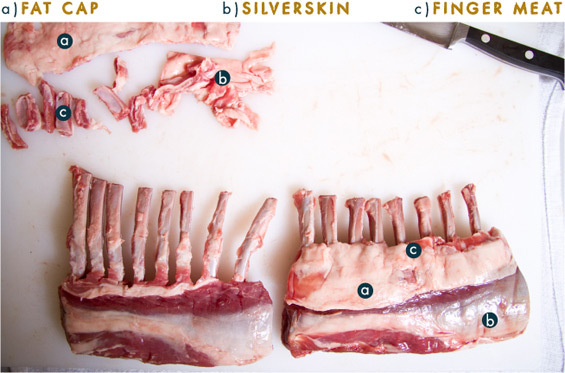 Optional: Tie the loin meat for a rounder eye (how to tie lamb racks). 1. Flip the frenched rack over so it’s resting on the bones. 2. Cut from the bottom up past the bones. 3. Flip the rack back over so the bones are on top, and continue to cut following the bones down. 4. Meet your cuts in the middle and remove the bones.